Flat iron skiffs are said to be easy to draw but very hard to get right. QT is my attempt at a flat iron skiff. 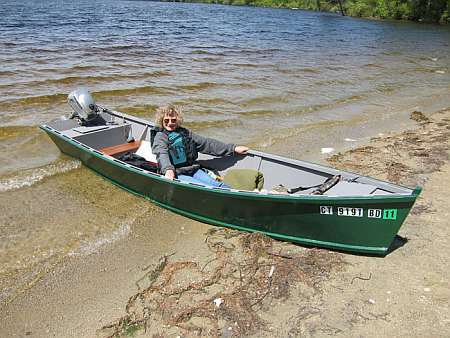 The prototype was built by Paul Krayniak of Odessa, NY and a photo of his boat is presented below. The above photo is of Brad Boerger's QT. I chose a size that will be easy to cartop and yet ample for two adults. The bottom is narrow for good rowing but still wide enough to allow stand-up stability, unlike a dory. The top is wide enough for good spread of the rowlocks. The result is pronounced flare at the midsection. But if the flare is carried forward, the result will be extreme rake at the bow. So I twisted the first four feet of the side planks to reduce the stem rake. This is simple nailed together job from three sheets of 1/4" plywood. No jigs, no lofting. QT has been around as a rowing skiff for a long time now and each set of QT rowing skiff plans includes a set of plans for a powered version of QT. I just got photos of a completed power version of QT from Barron Wester of Smyrna, Ga. 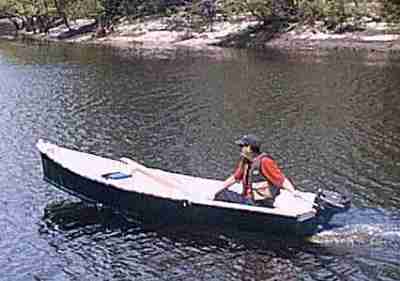 The photo shows him in his local waters using a 2.5 hp outboard. The power QT is nearly identical to the rowing QT except that its bottom runs straight aft from the maximum beam, a "straight run" as they say, with no rocker in the stern at all. This is critical in a power boat that will be getting some dynamic lift from its speed over the water (unlike the rowing version whose lift all comes from "displacement" of the surrounding water as the boat sinks to a level where its weight equals the weight of the water it has "displaced"). I think there are two reasons why the straight run is critical for a power boat. One is that as the boat speeds up it tries to climb over its own bow wave and as it does so it lifts its bow. The boat must have a lot of stern volume or else it will bury deeply at the stern and its bow will point to the sky alarmingly. The second reason is that with the typical outboard motor arrangement, most of the boat's weight is concentrated in the stern, the skipper's weight being usually the largest item. Even with no motion a good rowing boat with its fine stern lines can't handle that weight back there - its bow would point skyward and its stern dangerously close to swamping even without starting the motor. The upshot of this is that a good rowing boat can never be a good power boat, and a good power boat can never be a good rowing boat. By the way, power QT would be limited to about 5hp (maybe less) by the Coast Guard recommendations, and mine too. If you are lightweight it may plane with that power. Simple nail and glue construction from three sheets of plywood for either version of QT. No jigs or lofting.